Shopping for a reliable vehicle that won’t crash your budget? A new Chrysler vehicle from Gregg Young Chrysler Dodge Jeep Ram of Plattsmouth is a smart choice. The CDJR lineup features such a wide variety of cars, minivans, trucks, and SUVs that we’re certain you’ll find the model that is the perfect fit for both your lifestyle and your budget. Browse our new CDJR inventory find the ideal vehicle to meet your needs in Omaha today! Why Choose a New Chrysler Vehicle? Ready to explore even more CDJR models like the off-road capable Jeep Wrangler? 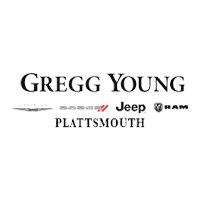 Contact Gregg Young Chrysler Dodge Jeep Ram of Plattsmouth today. Whether you are looking to lease or finance, we’re ready to help you drive away in the Chrysler vehicle that’s right for you.